Rising Seas are Flooding Saltmarsh Sparrow Nests. Can They Adapt? A recent study showed that Saltmarsh Sparrows choose nest sites based on past experiences. If a pair’s nest floods, for example, they’ll build their next on higher ground. While this behavior might seem to show resilience to rising seas and climate change, the authors note that populations have still declined by over 75% since the 1980s. In fact, nesting further away from the water a risky proposition for Saltmarsh Sparrows, and flooding is not the only threat to their nests. As with any species threatened by climate change, what appears to be a successful adaptation to environmental change often turns out to have unforeseen repercussions for the species. A Saltmarsh Sparrow in the cordgrass (Spartina sp.) of a New England Marsh. Photo by Shawn Carey. Nesting further from the high-tide mark comes with trade-offs. Nests over drier ground are most vulnerable to predators, which are the second-greatest cause of nest failure in Saltmarsh Sparrows aside from flooding. Small carnivores like raccoons, foxes, and even snakes have been spotted feeding on Saltmarsh Sparrow chicks in nests far from the water’s edge. Ticks, isopods, and other parasites also prefer drier nests. Some tidal flooding deters invertebrate pests, and may actually contribute to nestling survival as long as the nest isn’t completely inundated. Nests are most likely to be successful in a narrow band near the high-tide mark where they are safe from predators, parasites, and flooding. Researchers found that Saltmarsh Sparrows that lost their nests to predators would re-nest closer to the waters’ edge, just as birds with flooded nests would move to higher ground. But as increasingly severe storms now regularly push spring tides past their normal height, they wash over what was once the “sweet spot” between safety from predators and safety from flooding. 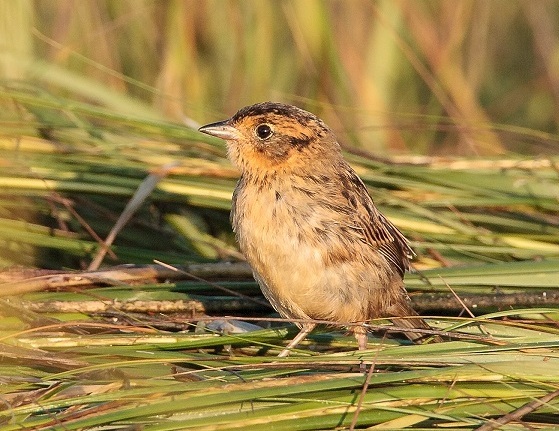 Climate threats to Saltmarsh Sparrows are borne out by the data. Their population is currently around 30,000 birds– half of what it was in 2010, and a shadow of the original population of 250,000. They continue to decline at around 9% annually nationwide, but in Massachusetts, careful management of saltmarshes has kept their numbers comparatively stable. Climate change is not the only issue facing Saltmarsh Sparrows. Over 1/3 of Massachusetts’ coastal wetlands have been developed. Dikes, railways, and other infrastructure disrupts the drainage of many remaining saltmarshes, raising the threshold for flooding but causing them to retain floodwaters for longer periods. Mass Audubon continues to monitor Saltmarsh Sparrows in Massachusetts and advocate for the species, including submitting a proposal to list them as an Endangered species at the state level in 2017. For tips on combating climate change, find out how to reduce your carbon footprint. For more information on Saltmarsh Sparrows, feel free to ask us a question in the comments! This entry was posted in Climate Change, Conservation Issues and tagged climate change, Rising seas, Saltmarsh Birds, Saltmarsh Sparrows, Sea Level Rise on January 16, 2019 by William Freedberg.